Antrim hurling suffered a huge blow as the county were relegated to Division 2A of the League following this 2-16 to 1-18 defeat by Kerry at Parnell Park. The Saffrons looked in control at half-time as they led 0-11 to 0-3. Colm Harty's goal helped cut Antrim's lead to two but the Saffrons appeared to have regrouped as PJ O'Connell's goal left them 1-13 to 1-8 ahead. 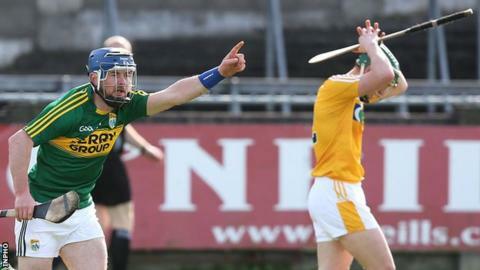 However, Harty's second goal helped the Kingdom level and while Antrim moved two up again, Kerry fought back to win. John Egan, a namesake of the late Kerry football great, hit the Kingdom's winner in injury-time with Conor Johnson missing a difficult late chance to take the game into extra-time. After a poor league campaign, the promotion-relegation play-off had always looked a tricky assignment for the Saffrons but the reality of this defeat will hit the county hard. Eamonn Kelly's Kingdom side outscored Antrim 2-13 to 1-7 in the second half as they made full use of the elements. Antrim were not particularly convincing in the first half but still managed to carve out a 0-11 to 0-3 helped by four successive Paul Shiels points. However, the interval score was not particularly representative of the play as Kerry had fired nine wides and also missed a couple of goal chances. The suspicion that the game was far from over began to take hold as points from Patrick Kelly, Shane Nolan and John Griffin cut the lead to five. Points from Shiels and Johnson appeared to have halted Kerry's momentum but the Kingdom were only two behind after Harty's 46th-minute goal helped cut the margin to 0-13 to 1-8. The Saffrons appeared to have regrouped immediately as O'Connell netted but the impetus was with Kerry and a series of Shane Nolan frees and Egan's injury-time point ensured the Kingdom's surprise success. Kerry's win earned them Division 1 status after twice missing out on that prize after winning the Division 2A title in 2013 and 2014. Antrim: C O'Connell; O McFadden, N McAuley, A Graffin; C McKinley, N McManus, E McAlonan; E Campbell, M Bradley; D McKernan, C Carson, P Shiels; C Clarke, M Donnelly, PJ O'Connell. Kerry: S Murphy; D Fitzell, P Costelloe, B Murphy; S Weir, D Dineen, D Collins; J Griffin, P Kelly; M O'Leary, S Nolan, C Harty; M Boyle, P Boyle, K Carmody.